Usk Castle01291 672563work CastleEnchanting, romantic ruins overlook the small town of Usk, and the wide river valley beyond. “It is like the secret castle that no one’s ever found” exclaimed a young boy, seeing the natural and peaceful setting, the ancient walls covered with creeper, and old stone towers inviting the visitor to explore. This is a medieval castle that fell into disuse 500 years ago, waiting to be discovered. Usk castle is open almost every day, during reasonable daylight hours. There is a box for donations on the left of the stone archway at the entrance, and as you pass, please take a pebble from the pot and put it into the wooden bowl – that’s how we count our visitors! The lane to the castle is opposite the Fire Station on Castle Parade, off the road leading east out of Usk to Monmouth and Raglan, and goes up hill to a small car park. Walk up towards the stone archway, where you will see a kiosk on your right, with castle guides and local information. Anyone with walking difficulties may take their car up the middle track-way to the top of the hill and park by the grey Tardus. There is a level way, ‘ The Bridal Path’ , to walk into the castle through the red metal gate, which is also suitable for accompanied wheelchairs. Enchanting, romantic ruins overlook the small town of Usk, and the wide river valley beyond. “It is like the secret castle that no one’s ever found” exclaimed a young boy, seeing the natural and peaceful setting, the ancient walls covered with creeper, and old stone towers inviting the visitor to explore. This is a medieval castle that fell into disuse 500 years ago, waiting to be discovered. We accept friendly dogs on leads, but please dispose of all dog poo (and the bags) as you will be fined otherwise. 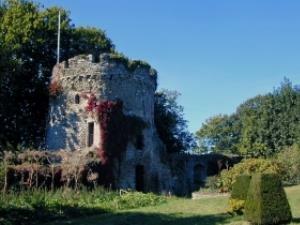 Usk Castle is open almost every day, during reasonable daylight hours. There is a box for donations on the left of the stone archway at the entrance. M4 Junction 24 & A449 signed for Monmouth; continue north until exit for A472 to Usk. The driveway to the Castle will be on the right, just before the fire station.